If you're one of those people who clean the car only once a year, "whether it needs it or not", then now's the best time to do it. After months of winter neglect a thorough clean will help to maintain the car's value and reduce the risk of long-term corrosion damage. The inside of the car could have remained damp all through winter while the underside is likely to be caked in salt laden mud which will cause corrosion if left. The inside of your car may well not have dried out properly all through the winter as wet shoes and clothes keep bringing in moisture while there's not been the heat or ventilation to dry it out. Discoloured upholstery, rotted carpets and general shabbiness can seriously reduce a car's resale value. Take out loose mats before vacuuming the carpets. If required, shampoo the carpets too but avoid using too much water and ideally choose a warm sunny day when doors and windows can be left open to help them dry - as long as you can keep a close eye on the car to prevent theft. Wet patches under the carpets are a sign of rain water penetration. This can lead to serious corrosion so should be investigated thoroughly. You'll probably need expert help as the point of water entry can be difficult to find. Accessory shops are full of cleaning products for upholstery, trim and roof linings, but make sure you use the right product for each material. Always do a test on a small patch first to avoid mistakes. Interior glass and painted metal surfaces need only a wipe over with clean water and a chamois leather. Remove winter grime from paint work with warm water and a suitable car shampoo. Start on the roof and work your way down and around the car, allowing stubborn dirt at the bottom to soak. Pay particular attention to the undersides of doors and sills and make sure that all the shampoo is fully rinsed off before drying the car. Attend to minor areas of corrosion, stone chips etc. as they will only get worse if left. Areas of extensive corrosion are best left to the experts. Stone chip touch-up kits are available from most accessory shops. Take your time and you should be able to acheive a reasonable finish. Polish offers some paintwork protection and will help to restore any loss of gloss on older vehicles. Use a good quality polish and follow the manufacturer's instructions. The underside of the car takes the worst of the winter weather. Mud soaks-up salt laden spray and, if left, will cause corrosion over time. Hose down the entire underside of the car, paying particular attention to the front and rear wheel arch areas. When dry check for signs of damage to the underbody sealing compound. DIY products are available if you know what you're doing otherwise it's best to get a garage to attend to any damage. The terms of any long-term anti-corrosion warranty might specify how such repairs should be carried out. If in doubt check with your dealer. Check tyres carefully for tread and general condition. The legal minimum tread depth is 1.6mm, but we recommend replacing them before the tread gets down to 2mm. Look for faults such as cuts, splits or bulges too and have any damaged or worn tyres replaced. Don't forget the spare. 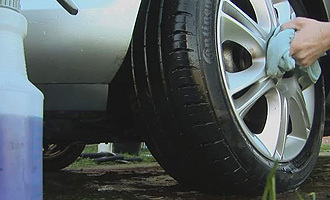 If you switched to winter tyres in the Autumn then now's the time to switch back to your 'summer' tyres.